Would You Sleep 40 Feet Underwater? Every girl who watched The Little Mermaid growing up was enchanted by Ariel’s undersea home. So imagine my delight when I discovered someone had built an underwater resort for adults. Welcome back to my Unbelievable Real Life feature, where I showcase weird creatures and offbeat places on our planet that seem like they should belong in a fantasy. Last time we explored an ice hotel (figuratively speaking) and met a bat that looks just like Jedi Master Yoda. Today we’re going under the sea since some of you mentioned you’d prefer a warmer adventure. Is the Resort Actually Under the Water? The Poseidon Underwater Resort is the world’s first fully-underwater resort. It’s so new I don’t think they’ve even had their first guests yet. You walk down a pier and take an elevator 40 feet down under the water. The pressure within the resort is the same as the pressure on the surface (just like in a submarine), so there’s no uncomfortable pressure in your ears and you don’t have to pass health criteria to stay as a guest. Each of the 24 available rooms is 70% clear acrylic (4-inches thick, which is longer than my index finger) so you can see the coral and aquatic wildlife around you. You can even press a button and feed the fish. Along with the rooms, the underwater resort includes a fine dining restaurant where you’ll eat your meals (included in the price of your stay), a spa, library, chapel, and fitness center. The restaurant rotates 100 degrees every hour so there’s no bad seat. This is SNUBA. See how they’re still attached to the surface and no heavy gear? If you have your PADI certification (my husband does) or are willing to earn your certification while there, you can SCUBA dive. 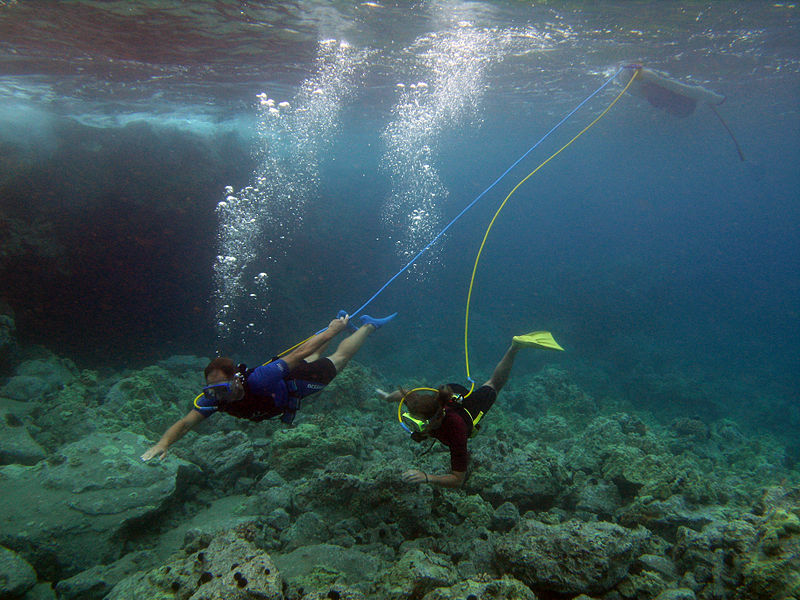 For those who find SCUBA diving too intimidating, you can SNUBA instead. Your airline is supplied from the surface and you can walk along the lagoon floor. All you need to remember is to breathe through your mouth. Clear waters allow you to see for 200 feet (about half a city block in distance). Apparently the water is a beautiful 83 degrees Fahrenheit (28 degrees Celsius). You can also learn to pilot a three-person Triton submarine, or if you want someone else at the controls, you can ride the 16-passenger submarine and sip drinks along the way. You can see the lagoon from the air via parasailing. 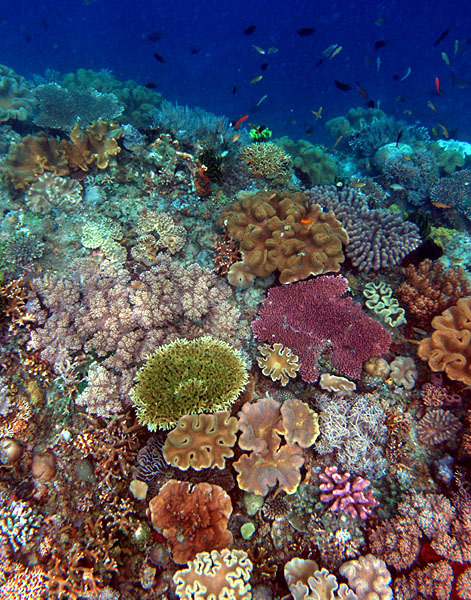 Because they knew a project like this would bring objections about the negative impact it could have on the environment, they formed the Poseidon Coral Reef Sanctuary Project. This non-profit focuses on conservation, research, and education. Visitors will also be able to visit the Poseidon Coral Farm, one of dozens of international organizations working to propagate coral and restore damaged reefs. You can find out more about the Poseidon Underwater Resort at their website. What do you think? Would you spend a night in an underwater hotel? Images: SNUBA divers (c) Jim Mayfield, president of Snuba International, Inc., via Creative Commons License; Coral Reef (c) Nick Hobgood via Creative Commons License.